A Gose is a predominantly wheat, low ABV beer that typically has a sour, tart lemon taste with some saltiness, a bit of coriander, and low to no hop flavors. They are usually thin and light gold in color resembling a pilsner. The taste profile is along the lines of combining a Witbier and Berliner Weisse with a dash of salt. The sour flavor comes from the use of lactic bacteria. Side Note: Although this style started in Germany in the 16th century, it doesn’t adhere to the Reinheitsgebot, Germany’s beer purity law that requires that only water, hops, and barley are used (yup, no yeast), due to the use of ingredients like salt. Before we talk about Gueuze, we need to discuss its beating heart, the Lambic. Lambics are becoming fairly popular and most hobby level craft beer drinkers have probably tried a few. Lambics are brewed in large, open fermentation “coolships”, which allow wild yeasts to aggressively get all up in the wort’s business. The rest of the beer is composed mostly of malt barley, some unmalted wheat, and hops long for the retirement home. Old hops are used because they add little flavor or bitterness, but still impart their inherent preservative powers. Fruit or fruit syrup (cherry, rasberry, peach) can be added once the fermentation process has started to create a Fruit Lambic. Lambics typically have a sharp, sour, and funked up taste, but can also have an acetic (vinegar) flavor as well. A Gueuze, also known as Brussels Champagne, is just an extension of the Lambic family, created by blending young and old Lambic beers. This is done so that the older Lambic can vampirically feast on the succulent sugar of the young lambic that hasn’t fully fermented. It allows a mature beer to further mature into something a little different and tasty, in a dry, sometimes mineral/metallic, and tart kind of way. 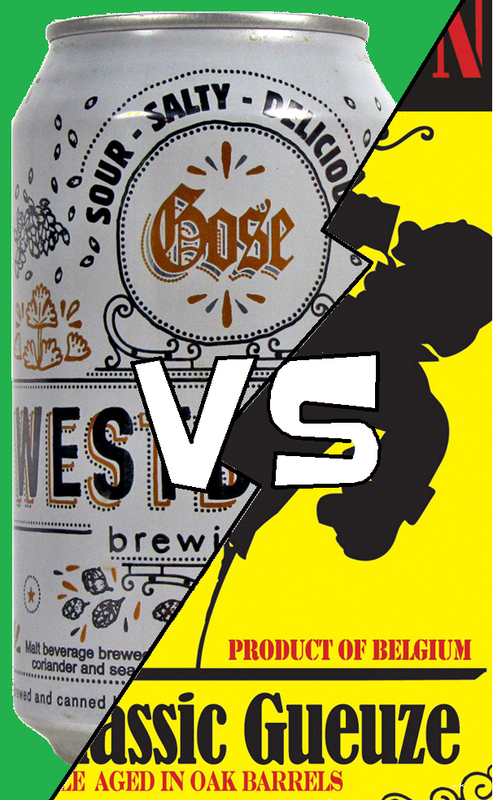 It’s apparent that a Gose and Gueuze don’t fall far from the sour tree; both are tartly sour beers brewed with wheat, next to no hop flavors or bitterness, and, for the most part, low ABVs. The differences creep in on the finer details, with a Gose having a crisp, cloudy body with salt and citrus/lemon qualities and Gueuze a dry, fruity character with a comparatively stronger yeast presence and acidic barnyard funk. Of course, this explanation won’t mean anything unless you get hands on with it. Below are a few examples you may want to try as further research. Now I see I could have just read your terrific post!